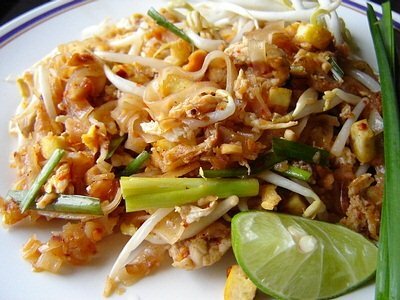 Pad Tai | Izzy have you eaten? How excited Little C was to have her Melbourne bestie come up to us in Sydney for the week-end. Excitement throughout our household as we adore this special person. We were all feeling very lucky to have her, as she has just found out through a series of not pleasant tests (not to mention dreadful symptoms) that she is Celiac, or gluten intolerant. I promised her mother we’d take good care of her, but none of us wanted to make a big deal about the new discovery. We had a lot of fun this week-end, and as Little C and I have been quite curious about gluten intolerance for a while now, having Miss P around did not change the way we ate much at all. The times we found it a little tricky were if we were in other homes, when we had not informed them of the situation. We are quite interested to see that Australian restaurants are most accommodating to Celiacs, and many have menus with clear symbols indicating which of their meals are gluten free. One meal out in the city with stunning views proudly claimed they were very happy to accommodate, but I was rather miffed that the portions were also quite reduced. Why would a Celiac want to eat LESS than anyone? I was determined to cook P a healthy, hearty, breakfast the next morning to make up for the previous night’s slim pickings. 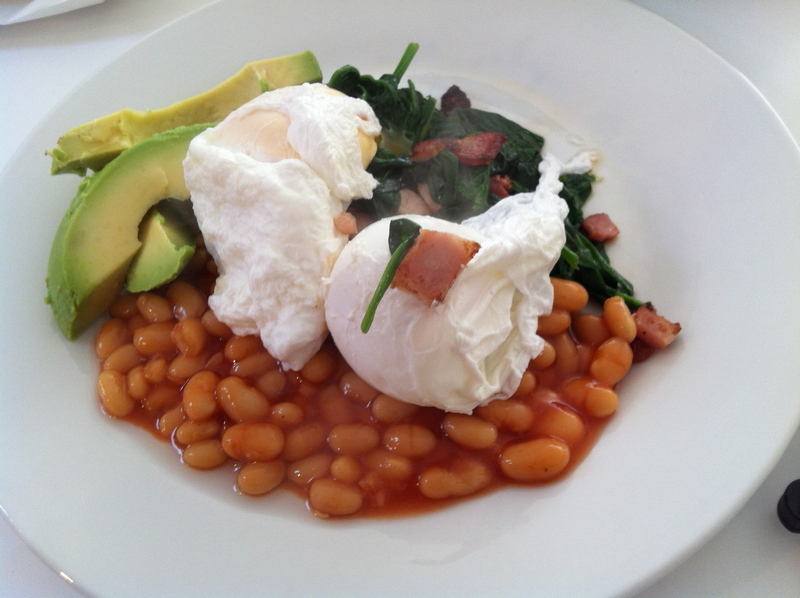 Hearty gluten free breakfast: wilted spinach with bacon chips, baked beans, poached eggs and avocado! Today we all wandered around Cockatoo Island, looking at art installations which are part of the Biennale of Sydney. If we weren’t looking at the art, we were being gob-smacked at the amazing views around the island in bright, mild, winter sunshine. And how civilized to come across a (temporary) noodle bar serving Asahi beer, pad thai, glass noodles with beef and black bean or dumpling soup. P and we happily tucked into gluten free pad thai while occasionally shoo-ing off a strident seagull or two. Yum! Check post on February 19 for my recipe. Getting home this evening, we sat around drinking cups of tea and nibbling on the chocolate cake I made for the week-end. Almond meal substituted for flour meant P could eat it too! Hooray. Come again soon! 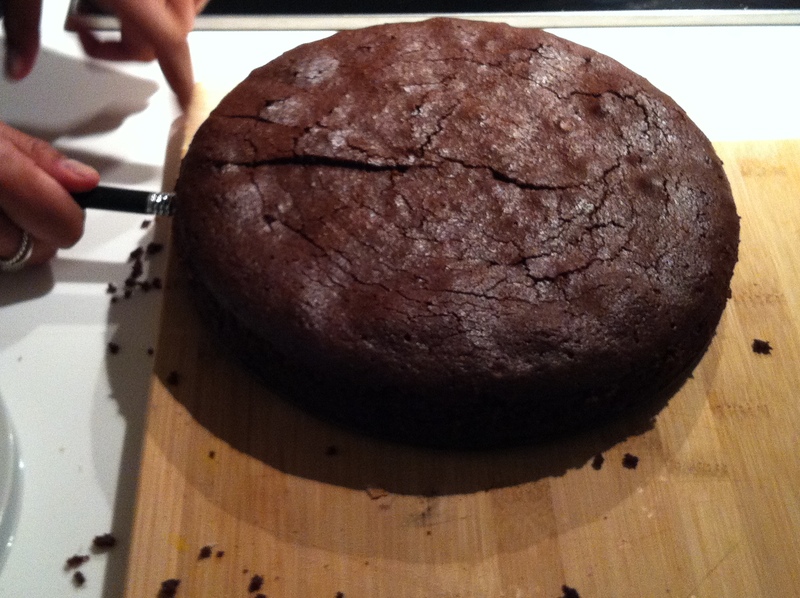 Chocolate cake with almond meal: check June 1 post for recipe.